From a black screen with a voice counting, in a huffing whisper, one to ten, appears an unknown face, young, glaring at us close-up as it bobs back and then forward, straight at us, fifteen more times, setting the syncopated rhythm that will give this film its meaning. It’s as if twenty-five times, with each sit-up, she begs the question, who am I? The girls get the message. Meeting three hours a day, three times a week, the pressure is on: the team has won the city-wide competition four years in a row. But they have no trouble practicing their steps everywhere they go — they can hardly contain themselves, with Beezy clicking and gyrating and breaking into antelope sprints chasing after Toni’s broom as she sweeps the gym floor. They may look a bit spastic in line formation as they squirm to keep up with the 8-16-24-count drills their coaches throw down, but Toni’s sit-ups and jumping-jacks and chin-ups (that she teaches her rambunctious little tag-along) keep her in shape, and Beezy’s just all moves, all the time. Unconsciously, it’s the solidarity factor that gets to them. They come in every size, shape, and color, each parading her own special hair-do, and yet they need to belong, and so they give each other tattoos, polish each other’s nails, pierce each other’s ears, and even mime each other in their most dire moments, all for a good laugh. But what they mime — in fact even record on their cell phones — is no laughing matter. One after the other, each falls into a fit — swooning, shaking, moaning, fainting… call it hysterics, seizures, “bewitched,” “possessed,” or call it nothing at all, because they don’t. In fact, they don’t know what to make of it. They check for contamination of the water. When it happens to the older girls, the younger ones ask if it’s some kind of boyfriend disease. And each of them experiences it differently. But one thing’s for sure — Toni wants no part of it. “I’m scared,” she tells her brother. When writer-director Anna Rose Holmer sunk herself in the initial research for her film, she came upon the term “mass psychogenic illness” and noted five separate elements that characterized it. The disorder struck members of a tight, cohesive group, and it was one with a strong hierarchical structure. The physical ills manifested showed no correspondence with an organic cause, yet they were highly contagious. Finally, the cases never seemed to be formally resolved or explained. She actually found cell phone videos online that documented the fits, ticks, and fainting spells of teenage girls, and one was made by the Q-Kidz Junior Squad (named after founder Marquicia Jones-Woods, known by the girls as “Ms. Quicy”). They had been learning a stand battle routine, which gave Anna Rose Holmer the form and content of her film. But how would she show the fears and travails of transitioning from childhood into the awkward zone of adolescence as girls become women? How to find a film language that suggested the covert, internal world through overt, external expression? Then the aesthetic became a matter of showing the dynamic between the girls’ quest for control of their own individuality (the captains display theirs in calling out the steps) and their desire to belong to the group that results in their conformity (as in response to their captain’s calls). The same could be said of Toni’s boxing drills with her trainer brother; spying on the dance team is her initiative at self-discovery. But whether in the ring or on the dance floor, Anna Rose Holmer coined a new lexicon of movement that traversed a spectrum from precise, powerful, and intentional (as in stand-battle, parade, and even boxing drills) to subconscious, spontaneous, and uncontrolled (as in collective hysterics). The director’s own modus operandi in her filmmaking followed a similar course. She immersed herself in the athletic/artistic life of the community center for five weeks before shooting her film, which was made entirely within three blocks of the boys’ and girls’ gyms. She enlisted the input of her teen thespians (all first-time screen actors playing themselves) into the script as co-authors, casting the entire team so that she could capture the nature of their bonding. All of this allowed the director to observe the conscious and unconscious movements of her protagonists and choreograph those movements into an entirely new film language. That new code for expression re-imagines how to use the camera as a lens at once wider and tighter. Showing Toni in her own isolated emotional space sometimes means using the wide-screen format to dwarf her in her solitude; other times it means masking off all but her point of view (such as through a narrow window in the gym door) with all that is right or left of the window in black or out of focus. In the conventional mirror shot, we sometimes become the mirror and feel challenged by this self-willed pre-teen to react. Often the camera settles on a reaction shot of Toni when the action she is watching — and enthralled by — is out of the frame, such as Beezy miming Maia’s fit. Toni’s quizzical, absorbed, patiently reflecting face, sometimes teasingly opaque, is a landscape unto itself, but the literal cityscape of bare autumn trees in a gray sky framing a freeway overpass is also enough to tell us Toni’s state of mind. As Toni peels off her tattoo or picks off her gold glitter nail polish or removes her earrings saying, “they were infected,” the camera moves in closer and closer to her, unafraid to use a lyrical, slow-motion speed to let us dwell upon her. And yet this mysteriously rapturous film never lets us out of its grip for a minute. “Royalty was incredible….” the director tells us. “We discussed the differences between daydreaming and being dazed, longing and desire, disappointment and motivation, knowing and understanding.” The subtlety and finesse with which she carries all the tension of the film in her body justifies any degree of non-verbal storytelling. 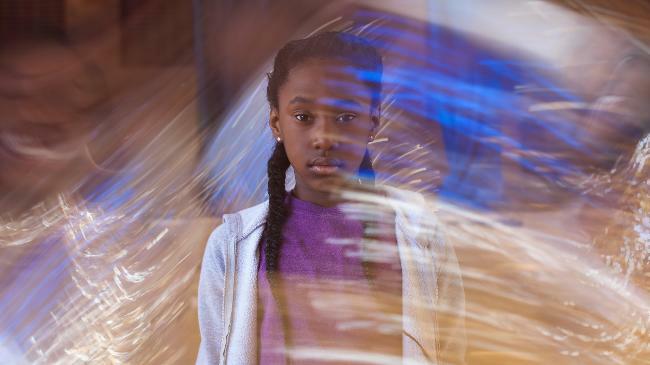 So then the richly textured choreography layered with boxing, dance routines, practice, improvisation, and, not least, the spasms that overwhelm the girls, can all be seen as “the fits” — a meditation of the movement of growing up “in fits and starts,” as it were. The layers of sound work in a similar way, ranging from an isolated instrument that haunts at an odd interval, or a few together striking a dissonant chord, to a lonely melody joined by the cacophony of traffic or screeching voices, to the click-clap-count pulsating rhythm that envelopes the film, to, ultimately, the singing female voice that elevates in the strangest way. Director: Anna Rose Holmer; Producers: Anna Rose Holmer, Lisa Kjerulff; Associate Producer, Marquicia Jones-Woods; Screenplay: Anna Rose Holmer, Saela Davis, Lisa Kjerulff; Cinematographer: Paul Yee; Editor: Saela Davis; Sound: Chris Foster; Music: Danny Bensi, Saunder Jurriaans; Production Design: Charlotte Royer; Costume Design: Zachary Sheets; Choreographers: Mariah Jones, Chariah Jones; movement consultant, Celia Rowlson-Hall. Cast: Royalty Hightower, Alexis Neblett, Da’Sean Minor, Lauren Gibson, Makyla Burnam, Inayah Rodgers, Antonio A.B. Grant Jr.
Color, Wide Screen, HD, 72 min. In English.